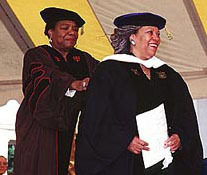 Nobel Prize-winning novelist Toni Morrison (right in photo) was among six distinguished recipients of honorary degrees awarded by Wake Forest University during today’s commencement. The ceremony also included the awarding of diplomas to approximately 1,348 undergraduate and graduate students. The commencement address was delivered by Louis V. Gerstner Jr., chairman and chief executive officer of International Business Machines Corp.
Dr. Jordan Jay Cohen, president of the Association of American Medical Colleges, doctor of science. Cohen also is the former medical school dean, president of the medical staff and director of the medical center for the State University of New York at Stony Brook. Louis V. Gerstner Jr., chairman and CEO of IBM, doctor of laws. Gerstner was named to his position with IBM in 1993. Before joining IBM, Gerstner served four years as chairman and chief executive officer of RJR Nabisco Inc.
Petro Kulynych, former chairman of Lowe’s Companies, doctor of laws. Kulynych, who helped found Lowe’s, served as chairman of the board, vice chairman and executive vice president. He is a four-term member of the Wake Forest board of trustees and a life member of the board of trustees for the Bowman Gray/Baptist Hospital Medical Center. Cora Bagley Marrett, social scientist, doctor of humanities. Marrett, a leading authority on race and ethnic relations, is a professor of sociology and Afro-American studies at the University of Wisconsin-Madison. Toni Morrison, Nobel Prize winning novelist, doctor of letters. Morrison has written six novels, including “Beloved” for which she received the Pulitzer Prize. Phyllis Trible, biblical scholar, doctor of divinity. Trible is the Baldwin Professor of Sacred Literature at Union Theological Seminary in New York.